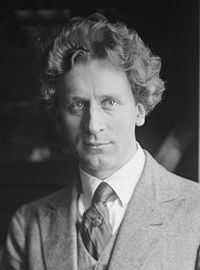 George Percy Grainger (8 July 1882 – 20 February 1961) was an Australian-born composer, and pianist, who worked under the stage name of Percy Aldridge Grainger. p.4: He [John Grainger, Percy's father] had started the first string quartet in Adelaide. By a strange coincidence, in 1883 the same string quartet, which by then had formed itself into a club, took on as its honorary director a twenty-four-year-old English immigrant by the name of Cecil Sharp [vegetarian] - who on his return to England was to have such a profound and stimulating influence on the English folk-song revival in which Percy Grainger was to play an important part. However, by 1883, the Graingers were living in Melbourne, Percy was born there in 1882. Percy's mother's family remained in Adelaide so they probably visited, but we have no indication of whether Sharp actually met the Graingers at this time. p.17: He found the school-children's habit of torturing chickens particularly distasteful, though at times he himself was known to be cruel to cats. p.23: By this time  Rose [his mother] had decided to take her son to Frankfurt-am-Main, where he would continue his studies in the world-famous Hoch Conservatorium of Music. - and where he would also meet a surprising number of vegetarian musicians. p.29/31 [written by Percy]: "When Cyril Scott [vegetarian] returned to Frankfurt around 1897 [Percy was 15], we were all enchanted" ... the English held the whole field in Frankfurt. Cyril Scott outsoared all others ... one would hear teachers talk of the English as unmusical, but the next moment they would mention Leonard Borwick [vegetarian. former-student] ... Amongst his [Ivan Knorr's] many talented students were ... Herman Sandby, Carl Friedberg [later prof. at the Juilliard NY], ... and Cyril Scott [all three were vegetarian at some time]. p.33/37: During his years in Frankfurt, Percy fell in with four English students at the Conservatorium: ... Cyril Scott ... They called their new Australian friend 'Perks'... in many ways Cyril Scott became a father substitute in Percy's mind in those Frankfurt days. ... [Scott writing later:] "Perhaps the most astonishing feature in Grainger's make-up at the time was his capacity for eating cakes: I have seen him polish off ten Berlin pancakes for his tea alone, and without noticeably bad effects". ... It was Cyril Scott who introduced Percy to the music of Alexander Scriabin [vegetarian] ... Percy explained the love he had developed in Melbourne for oriental music. This of course rang a concordant note with Scott, who had always been attracted by things oriental [including the food]. ... Herman Sandby, a Dane, was to become the closest of Percy's male friends. p.70: Running, in fact, was his main physical recreation and he soon became known as the 'jogging pianist' [common enough today, but this was 1900] ... because of his piano career his mother had forbidden him to play football ... Whenever possible Rose and Percy would attend lectures by George Bernard Shaw. They liked his books and plays, and found a great appeal in his brand of socialism. Shaw unwittingly repaid their interest some years later when he chose Mock Morris and Shepherd's Hey, as entr'acte music for the first London production of Pygmalion in 1914 [which later became the musical 'My Fair Lady']. p.88: In South Africa Grainger continued his astonishing walking feats. Once he walked between Pietermaritzburg and Durban (about sixty-five miles) between midnight after a Friday evening concert and 6.00 p.m. just before the Saturday evening concert. p.90: Alfhild [Herman Sandby's fiancee] ... her mother was a confirmed theosophist and spiritualist ... theosophical and Swedenborgian ramblings... [suggesting she would probably have been vegetarian as well - Herman, Alfthild and Percy went on performing tour of Denmark: ] ...For much of their travels the food they consumed consisted largely of stale cheese sandwiches. Though Percy considered this a delicacy the frugality they felt forced to endure disturbed Alfthild to the extent of threatening to quit mid-tour if their expenditure on food was not increased. Her demands were met. p.99: When Rose and her son moved into 31a Kings Road [London] ... the gatherings were resumed under Grainger's supervision ... The group took fresh impetus from other young composers such as the gentle and mild mannered Gustav von Holst [vegetarian]. The following pages have many further references to Sharp, Scott, Sandby and others above. Also to collecting folk songs in Gloucestershire with Eliza Wedgwood, great-granddaughter of Josiah, who was possibly one of the Wedgwoods who were vegetarian theosophists. p.146: [Grainger writing in later life about events of 1914-18] "Perhaps these assaults [musical sweet and harsh] upon the tenderness of men's hearts ... will play their part in weaning men from massed murder of mankind in war, & massed murder of animals as food." .... Although Random Round was almost totally neglected by the musical world, it is an important early instance of aleatory composition, planned in the year in which John Cage was born [avant-garde vegetarian composer who later developed similar ideas]. p.155: His main worry around this time  was Rose's health ... As the direct result of a conversation with a nature-cure specialist, she went on a diet consisting almost exclusively of green apples and nuts. Her headaches and sleeplessness left her and her eyesight improved [then she seems to have returned to meat-eating]. p.161: Grainger wanted Sharp to receive half the royalties [for Country Gardens] as a token of his respect and gratitude for providing him with the tune [a folk song Sharp had collected] ... Sharp refused. Had he accepted, he would have probably become a rich man, for this setting was to break all records for sales in years to come. p.177: In England Cyril Scott was becoming recognized as an authority on nature curing, occultism and related paranormal subjects [the Vegetarian Society UK has several of his relevant books]. Grainger's mother died in 1922 and was cremated, but he kept her ashes for two years until he could bury them in Adelaide. He was then 42, and unmarried as any woman in his life had to deal with his mother, and soon backed off. She was extremely possessive, jealous and controlling, but he just seemed to accept that. The biographer, Bird, seems to see nothing in the extraordinary 'coincidence' that within months of burying her ashes, Grainer turned vegetarian, and the following year met the woman he would soon marry. Rose would not have tolerated any '-isms' in his life any more than any other women, but we can see from everything above that he was, in reality, semi-vegetarian for most of his life anyway. But you may ask why I, who all my life have enjoyed warlike & violent mooded literature, should be so much against war/ One answer to that is that since war has ceased to be hand-to-hand fighting, its appeal to the savage side of our nature doesn't amount to much. It isn't sporting. Yours, for meat-shun-ment & world peace, Percy Grainger. This last line shows one of his other quirks that had been developing for many years - the insistence on what became known as 'Anglish' or Anglo-Saxon English, excluding any words of latin or greek derivation - including 'vegetarian'. So he called himself a 'meat-shunner'. P.189 cont. : Percy's eating habits became fraught with difficulties because, though he had become a vegetarian, he was not in fact particularly find of vegetables [the usual ignorant assumption the vegetarians only eat vegetables...]. He did, however, eat large quantities of nuts, plain boiled rice, wheatcakes, bread and jam, cream cakes, ice cream, oranges (which he ate like apples, pith, pips, skin and all) and the occasional salad. He usually jotted down in his dairy the constituents of each meal as well as the places where he ate. p.200: During December and January [1928-9] the newly wedded couple spent one month at a vegetarian sanitarium in Battle Creek [Michigan, the one founded by John Harvey Kellogg - this seems to have been Percy's idea of a honeymoon...]. The book continues in much the same way until Percy's death in 1961, with frequent mentions of all the people above, especially Scott and Sandby, but has nothing more to say about his 37 years as a vegetarian.